Pop Artist. Provocateur. Catholic. Who was Andy Warhol? Andy Warhol, Self-Portrait, 1964 via The Andy Warhol Museum, Pittsburgh. The Andy Warhol Foundation for the Visual Arts, Inc.
Washington D.C., Dec 31, 2015 / 05:54 am (CNA).- Chances are you've heard of the phrase “15 minutes of fame.” And you've probably seen the neon-colored canvases of Campbell soup cans or Marilyn Monroe's face – even if you don't know the artist behind them. 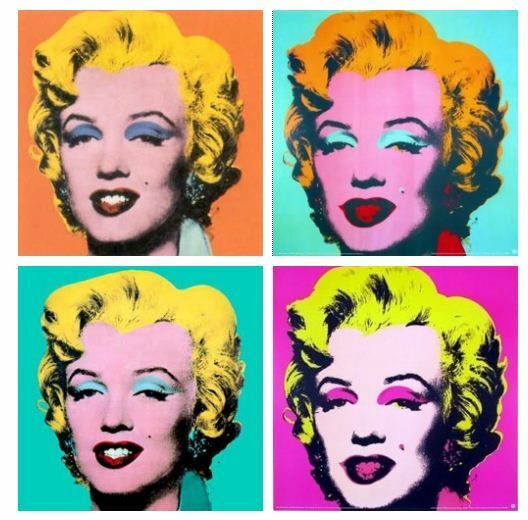 For those who've never studied Andy Warhol and his prolific body of work, they've still most likely encountered it in many of the pop icons of the late 20th Century. But while Warhol may be known best for the his visionary depiction of fame and popular culture, his art can also be understood as iconic – in another, much more literal, way. Why? Because he was an ardently practicing Byzantine Catholic, say those close to the artist and his work. In fact, they say, Warhol's art is actually best understood through the lens of faith and iconography. However, these same voices warn that both the art world and Catholics alike have tended to oversimplify or ignore aspects of the man that, to this day, refuses to be categorized. “Warhol's a very complicated person and whatever angle we really try to take to his art, we can take one angle to come from but it's always going to be incomplete if we don’t take another angle as well,” said art historian Dr. James Romaine. 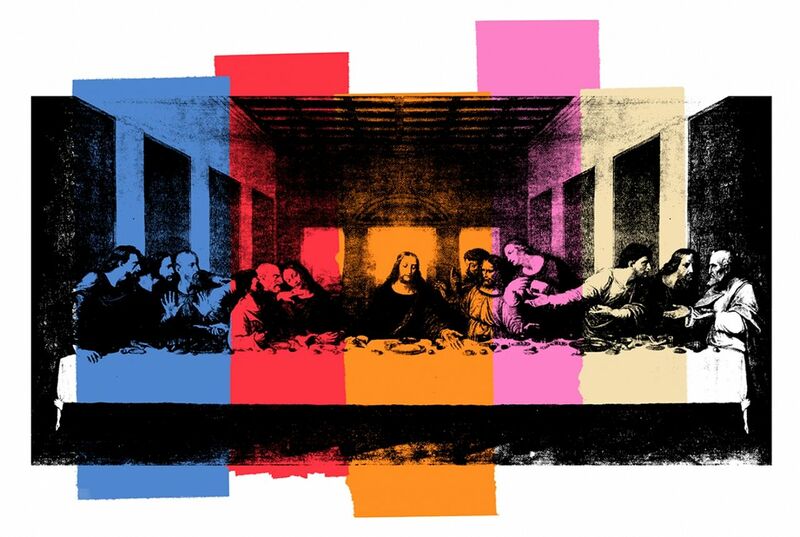 Romaine, who also serves as president of the international Association of Scholars of Christianity in the History of Art, said that the widespread read on Warhol's work – that it's largely a critique of consumerism – actually isn't at odds with a more religious interpretation of his art. “The more popular description of Warhol's work being concerned with popular culture, commodity culture, I think that's all true,” he told CNA. So who was Andy Warhol? Or should we say – who was Andrew Warhola? The artist who would become Andy Warhol was born as Andrew Warhola on Aug. 6, 1928, in Pittsburgh, Pennsylvania. His parents, Ondrej and Julia Warhola immigrated to the United States in 1914 and 1921, respectively, from what is today Slovakia. They raised their family of three sons in the Byzantine Catholic Church. Andrew was often sick as a child, and spent much time bedridden, collecting pictures and drawing. His father passed away in an accident when he was just 13. After high school, Warhol studied commercial art at the Carnegie Institute of Technology, later renamed Carnegie Mellon University. Following graduation in 1949, he moved to New York City, where he worked in magazine illustration and advertising, and also started signing his last name “Warhol,” rather than “Warhola.” His mother joined him in New York in 1952, where she lived with her son until her death in 1972. Throughout the 50s and 60s, Warhol gained attention for his painting techniques, and later photography, film, installments and multi-media exhibitions. The late 1960s also brought Warhol close to death when he was shot near the entrance to his Factory workspace. After the shooting, Warhol continued to work prodigiously, co-founding Interview Magazine, designing record covers, producing television programs, and continuing to paint both commissioned works and his own artistic series. He passed away suddenly on Feb. 22, 1987, during a routine gallbladder surgery. In the nearly 30 years since the artist's death, his art has left a lasting impact on society not only due to the vast popularity of his work, but the major themes he wrestles with and explores. “Warhol has been celebrated by critics and art historians for his ability to probe some of the most challenging themes of modern society: identity politics, celebrity, death, religion, desire, and the capitalist machine,” said Jessica Beck, assistant curator for The Andy Warhol Museum in Pittsburgh. But while a small amount of religious work has been explored by scholars such as Lynne Cooke and Jane D. Dillenberger, largely these themes – “relative to the Pop paintings of Campbell's Soup and Coca-Cola or the celebrity portraits” – are “somewhat under-researched,” Beck said. For Warhol, faith was an integral part of family life and a daily practice – and both of these remained important to the artist until his death, according to his nephew, Donald Warhola. From among Warhol's personal collection displayed in the Warhol Museum after his death are religious items such as a sculpture of the Sacred Heart. But for the Warhola family, the Catholic faith was more than daily practice, and was a key part of their family life and source of personal strength. “Sunday was meant for worship,” Donald said. He added that his grandparents – Andy Warhol's parents – raised their sons to place Church and visiting with family first on Sundays. Even when Andy Warhol moved from Pittsburgh to New York City in order pursue his art career, faith remained an important familial touchstone. Donald Warhola also got to know his uncle in a working environment was well, installing a computer system for Andy for several months before his death at Andy Warhol Enterprises in New York. At work, Donald describes his uncle as “quiet” but also a hard worker and fair employer, bringing their family emphasis on hard work into the workplace. “He wasn't too much different, but it was interesting to see Uncle Andy in that element and his work element as opposed to the more casual, laid back visiting at his place.” These “really basic and old school” lessons from his uncle stuck with the then-24-year-old Warhola. Donald recounted meeting someone in New York who wanted to design the young worker a “fancy business card” to use for future job searches. Uncle Andy told him “a fancy business card won't get you work,” but promised that if he did a good job at his work, he would write his nephew a good referral and help find him a good job. Warhol's diaries also provide a record of his internal religious life, documenting weekly Mass attendance, volunteer work at a parish soup kitchen, and his experience of meeting and shaking hands with then-pontiff Saint John Paul II in 1980. He also recorded his anxiety being surrounded by the “scary” crowds in St. Peter's Square waiting for the Pope, although he fought off his nervousness in order to sign autographs for several nuns. Warhol additionally wrote that he screamed after the assassination attempt on John Paul II in 1981. Just as faith played an important place in Warhol's life so too did it surface as an important topic in his art. He worked on several explicitly religious pieces, including appropriations and reinventions of Raphael's “Madonna” and da Vinci's “Last Supper.” A camouflage version of the latter, Romaine observed, can be interpreted as “bringing back the halo on and over Christ’s head,” which was removed in da Vinci's original humanist painting. 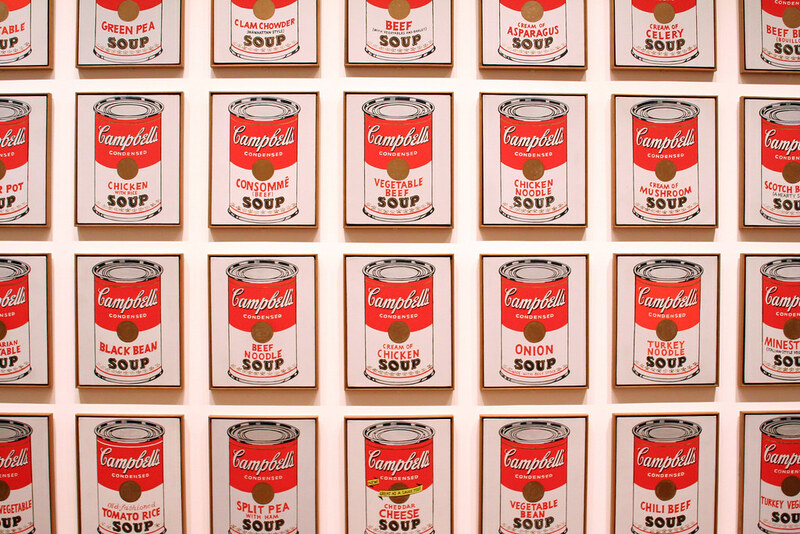 He said that by viewing Warhol's work – particularly his paintings – with an eye towards iconography, “I see all of Warhol's work as potentially sacred.” As an example, Romaine pointed to the now-iconic printing of the Campbell soup can. The soup can also had a ritual tie to Warhol's life. He recalled Warhol's brother mentioning “Andy eating Campbell’s soup every day, having a soup and sandwich every day, and the importance of religious imagery in their home” – including over the kitchen table where Warhol ate his soup. Similarly, Romaine said, people are presented in a glorified, redemptive manner in Warhol's paintings. Warhol also portrays Elizabeth Taylor, another actress dealing with scandal at the time of the painting. “If you're familiar with the Christian concept of the transfiguration...Christ appears to his disciples not as he is, but in a glorified way. He's not just this guy walking around, but he's glorified. Daniel Warhola agreed that, while “we never had a conversation on that topic,” it makes sense to him that Eastern iconography would have an influence on his uncle's artwork. “Perhaps I'm jaded because I grew up in the same environment but to me it seems obvious: the Byzantine Catholic Church is all about Heaven on Earth and you are stimulating the various senses and your eyes with the various icons and beautiful stained glass windows, and you know that the smell of incense and the sounds,” he stated. However, while Andrew Warhola was a man of faith and his Catholic understanding of the world did make its way into his art, Andy Warhol also dealt intimately with themes such as fame, popular culture, mass production and sexuality – that would become nearly ubiquitous in the 30 years after his death. “From a standpoint of when I look at the body of work that he did in the 60s and 70s, even 80s, he was always touching on what was going to be popular in the future.” Warhola pointed to his uncle's prediction that “in the future everyone will be world-famous for 15 minutes” and art projects such as the filming of ordinary people living their lives. Some of the trends Warhol explored extensively were that of sexuality and sexual orientation, which he revisited throughout his professional career. “There's no question that Andy Warhol was homosexual,” Romaine said. Indeed, several scholars, such as Dillenberger, have documented that he was open about his attractions since the 1950s, and several of his art projects explore his fascination with voyeurism and the sexually explicit. These tensions between faith and sexuality, introversion and explicitness wrapped themselves around some of Warhol’s work with identity, Romaine said, bringing up the series “Ladies and Gentlemen,” portraits of drag queens and transsexual attendees at New York clubs. In looking back, Warhol's nephew also sees the question of identity as one that concerned his uncle personally and that Andy Warhol explored in his work. Towards what would be the the end of his life, however, Andrew Warhola shifted focus from feeding the expectations others had for Andy Warhol. “He wasn’t painting necessarily for other people, but was more painting from his soul, and he did a lot of various religious works,” Donald Warhola noted, bringing up “The Last Supper” paintings and the “Heaven and Hell” series. Romaine suggested, however, that the resolution of identity and other themes in Warhol's work can be seen throughout his career – and underlying that resolution is a distinctly Catholic theme. He directed attention to the resolution of male and female identities in “Ladies and Gentlemen” and other paintings, brought together with the understanding of iconography he sees in Warhol’s corpus. Another example of an artistic imagining that not only elevates the base, but resolves conflict and redeems a subject, Romaine said, are the prints of Marilyn Monroe. “This desire in his depictions of Marilyn, to reconcile these different Marilyns with each other I think projects from his own desire in his own life of having so many internal conflicts: of being on the one hand successful, and on the other feeling like a failure, on being on the one hand desirous of relationships and being unable to realize them,” Romaine said. This article was originally published on CNA Aug. 27, 2015.